Jiménez, Luis González; Pascual, Luis Blanco: Multicriteria cash-flow modeling and project value-multiples for two-stage project valuation; in: International Journal of Project Management, Vol. 26 (2008), No. 2, pp. 185-194. I am not the expert in financial engineering, though I built my fair share of business cases and models for all sorts of projects and endeavours. I always thought of myself as being not to bad at estimating and modelling impacts and costs, but I never had a deep knowledge of valuation tools and techniques. A colleague was claiming once that every business case has to work on paper with a pocket calculator in your hands. Otherwise it is way to complicated. 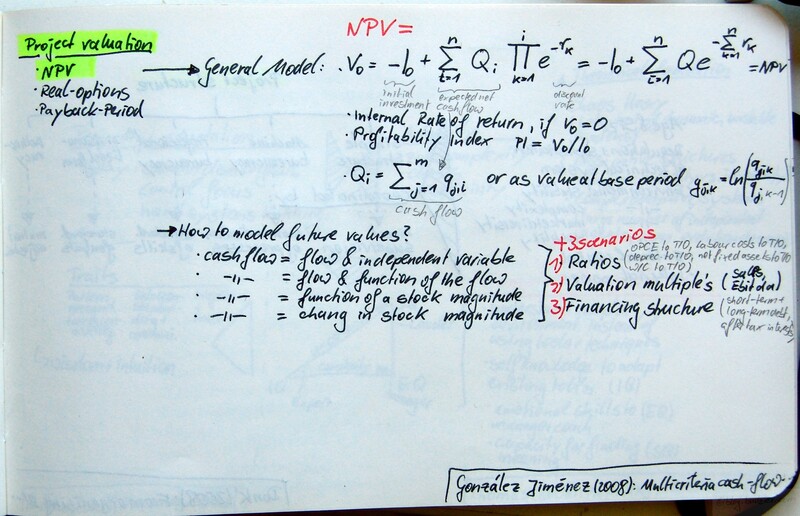 Anyhow, I do understand the importance of a proper NPV calculation, to say the least even if you do fancy shmancy real options evaluation as in this article here, the NPV is one of the key inputs. Jiménez & Pascual identify three common approaches to project valuation NPV, real options, and payback period calculations. Their article focusses on NPV calculation. They argue that a NPV calculation consists of multiple cash flow components and each of these has different underlying assumptions, as to it’s risk, value, and return. This formula also gives the internal rate of return (IIR) if V0=0 and the profitability index (PI) is defined as PI = V0/I0. Furthermore Jiménez & Pascual outline two different approaches on how to model the expected net cash flow Qi either as cash flow Qi = ∑qj,i or as value based period gj,k = ln (qj,k/qj,k-1). This entry was posted on Dienstag, Oktober 7th, 2008 at 06:07 and is filed under Decision Making, Methodology, Planning. You can follow any responses to this entry through the RSS 2.0 feed. You can leave a response, or trackback from your own site. This site has tons of information about private student loans and loan consolidation….